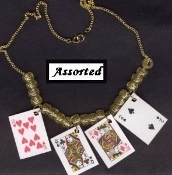 PLAYING CARDS NECKLACE - BlackJack Gin Rummy Lucky Charm - Poker Luck Jewelry - Assorted Plastic coated paper charms. Approx. 1.5-inch (3.75cm) Tall x 1-inch (2.5cm) wide, on 18-inch (45cm) Neck Chain, with your color choice of acrylic Beads. All 4-suits, assorted our choice or yours, for your favorite gambler! Enter card or suit choices in personalization text field, if desired. Choose cards, bead color, neck chain or cord! *Please Note: We will send neck chain as described and our choice of assorted cards and suits, if no options are chosen.